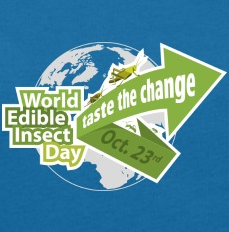 HAPPY WORLD EDIBLE INSECT DAY! To celebrate, I ordered 500 mealworms, 500 waxworms, and 1,000 crickets! I’ll be cooking them up starting next week! Pretty excited to taste waxworms!! Not too thrilled that I can’t #tastethechange today. While Big Cricket Gourmet actually sells crickets specifically raised for human consumption, they are fairly expensive. Rainbow Mealworms offers a wide variety of critters to choose from at a very reasonable price. Fluker Farms also has reasonable prices. There are plenty of resources out there for you to learn more! If you have any questions about where to find additional information about entomophagy, cultural entomology, or raising mealworms or crickets, please, ask away! Previous Post Mealworm Frittata! BRUNCH NOMS!